Optimal light spectrum to speed growth and keep plants from becoming spindly. Ease of height adjustment to keep lights 2-4” above the seedlings. The Sunlite Garden has all these features and comes in different sizes to match your needs. 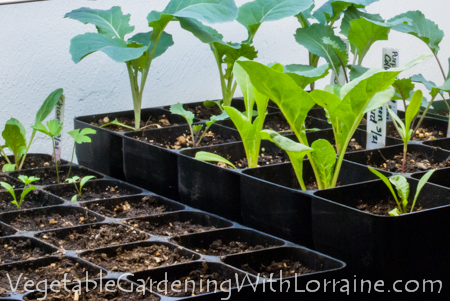 These no-frills, deep-root seed starting trays, which come in 15, 28 and 40-cell sizes, are the best I have ever found. They're deep enough for excellent root growth and durable enough to last forever. Plus, they're inexpensive! They can be purchased with an optional self-watering mat and grow dome to hold humidity (shown on right). Note: I never use "plantable" peat or cow pots because they impede free root growth after planting (while you wait for them to rot), and you have to buy more every year. 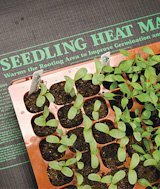 Nothing speeds germination and growth like a seedling heat mat. These low wattage, waterproof mats add 10-20 degrees of warmth underneath your seedlings, keeping them healthy, happy and growing strong. Especially important for heat-loving peppers, cucumbers and eggplants.